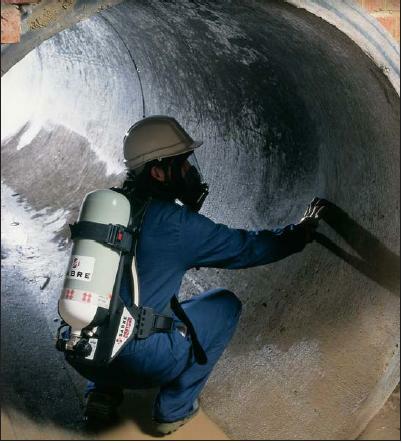 The Sabre Safety Contour 100, in combination with the Vision 3 facemask, offers wearers and specifiers new levels of comfort, improved fields of vision, true operational flexibility and low cost, simple maintenance in a self contained breathing apparatus that fully reflects Sabre Safety's stated philosophy: to produce equipment that our customers will wear by choice, not just by necessity. The ergonomic injection moulded composite backplate is the heart of the Sabre Safety Contour 100. The lightweight webbing harness ensures optimal load distribution, balance, comfort and reduced wearer fatigue. All hose connections features Sabre Safety's simple and proven U-clip/O-ring design, which is very reliable and simple to maintain. Different high and medium pressure hose connections ensure foolproof assembly. The Sabre Safety Contour 100 is designed for use with either the Vision 3, PanaSeal or PanaVisor facemasks. Sabre Safety masks are manufactured from non dermatitic materials and feature Sabre Safety's side mounted demand valve and front speech diaphragm. The Tempest automatic positive pressure demand valve features low breathing resistance and unsurpassed dynamic performance; particularly at high flow rates. The compact, low profile shape minimises snag hazards, with the bayonet fitting being simply connected and featuring a safety locking catch. A true bypass facility simplifies checking and donning procedures and ensures fail safe operation. The Sabre Safety Tempest demand valve is fully user serviceable and offers low maintenance and servicing costs. 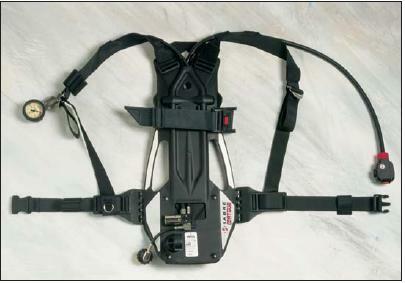 1045573 CTR-100 Contour self contained breathing apparatus for single cylinder use, comprising light weight anti-static composite backplate with Kevlar cylinder band and fully adjustable unpadded body harness, Two stage pneumatic system comprising Tempest automatic positive pressure demand valve with bypass, shoulder mounted pressure indicator and 55 bar warning whistle: first stage pressure reducer with single high pressure cylinder connector. Harness fabricated from flame retardent 50% Kevlar blend materials and features a half lumber pad.